George Urton Passes in March of 1939! George Urton was 77 years old in 1939. He had been sick for a while and he finally succumbed on the 13 of March, 1939. George Urton was laid to rest in the Pine Ridge Cemetery per his death certificate. I have yet to find out if this is where he is buried. I walked the cemetery but did not find his tombstone. Find A Grave does not have a memorial for him at this time. George Urton Passes Monday, Services Saturday. George Urton passed away at his house here late Monday night, following a lingering illness. Mr. Urton was 76 years of age at the time of his death. Funeral services will be conducted from the Chapel of the Northlund Funeral Home, Saturday afternoon at 2 p.m. with the Rev. Meade officiating. The internment will be made in the Pine Ridge Cemetery. A complete obituary will be published next week. Card of Thanks – We wish to express our sincere thanks to the many friends and neighbors who assisted us during the illness and death of Mr. Urton. We especially which to thank the Olson Brothers for their inspiring songs, Rev. Mead for his comforting words, those who brought the message by song and to those who sent floral offerings. Signed Mrs. George Urton and Grandchildren. George W. Urton was born in Birmington, Ohio, on May 5, 1862, and spent his early life in that state. 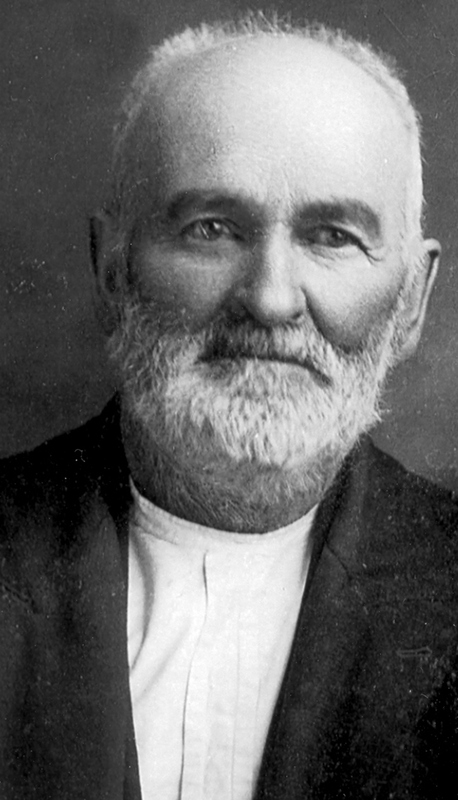 He came to Pine River about 24 years ago, having spent a few years previous to that in Mora, Minn. On June 24, 1919, he was married to Mrs. Amarilla Dawes, pioneer resident of Pine River. With the exception of the winter of 1934, which they spent in Florida because of Mr. Urton’s health, he has made his home continuously in Pine River since coming here. Mr. Urton passed away Monday night, March 13, after a short illness at his home. His health had been frail since a long illness a year ago last fall. Funeral services were conducted Saturday afternoon at the Northland Funeral chapel with the Rev. Robert Mead officiating. Burial was made in Pine Ridge cemetery. Note: There is no Birmington in Ohio, but there are three Birmingham, Ohios in several counties. I step back in time and revisit George’s first marriage. I found an obituary for his wife Serepta and it gives more information about their lives. I am not clear on the children from this marriage. They mention a daughter in the article below but I did find a marriage for a George Urton born about 1894 to a Mary Pederson in 1915 in Walker at the court house. I assumed it was a son. Death of Mrs. Urton – Wife of George Urton Died of Apoplexy at Home, 1709 Oak Street, Wednesday Morning. The Brainerd Dispatch, Wed. January 13, 1915. Mrs. Serepta Urton, aged 50, wife of George Urton, died of apoplexy Wednesday morning at her home, 1709 Oak street. She leaves a husband and a daughter, Mrs. B.L. Yount, of 1601 Oak Street. Mr. and Mrs. Urton have made their home in Brainerd since March of last year. Previous to that they lived in St. Paul and Mora, coming originally from Wilmington, Ohio. She has a brother, Chauncey Littleton, living on a farm near Tadmore, Ohio, a brother, Clark Littleton, at Moran, Illinois. Three sisters, Mrs. Clara Moran, Mrs. Ossa Moran and Miss Alice Littleton, reside in Wilmington, Ohio. Mrs. Urton was member of the Methodist church. The funeral will be held at 2 o’clock Friday afternoon from the residence. The sympathy of the community is extended to the family in its bereavement. I really don’t know much about Amarilla and George’s relationship but I think that this third marriage worked out for her. It appears they both were not of good health in the later part of the 1930’s. In November of 1939 her friends and the town would celebrate her life with a birthday party, hopefully, that was a bright spot in a sad time for her, she was not unfamiliar with tragedy in her life. Before I launch into the lives of Daniel D. Spracklin’s children, I will be taking a break from posting to this blog. Every year the Delano Kindred has a reunion in some part of the United States where a Delano descendant settled. I became a member many years ago. It is not a strict hereditary society they accept your casual lineage without question. I guess they figure you know what you are doing. The membership is reasonable in cost. This year their reunion is in San Diego, California. I have been wanting to go to one of these reunions and almost made it several years ago when they were near San Francisco but that didn’t work out. This year I am attending and will be giving a report on my other blog titled: Solomon Goss in Fearing Twp., in Ohio (see link on the right side of this blog). I am following it up with a visit to Disneyland which I have not been to in 15 years. The Mouse has been renovating and I have to check out all the changes. I have been to San Diego several times over the years so I am somewhat familiar with the city. I have done research in San Diego on my cousin Paul H. Goss who did a great deal of work on the Goss family. I also studied my mother’s side. We drove up the coast to Laguna Nigel (closed) when NARA was still there and I sought out immigration records and then we went to the Los Angeles Public Library. The genealogy section was at the very bottom floor of that amazing library. We took the escalator down down down. So why am I interested in the Delano Kindred, well Amarilla’s mother was Elizabeth Keller Spracklin and her mother was Mary Anne Delano Keller. The Delano family goes back to Philip Delano who sailed on the second ship to Plymouth, the Fortune. Here is a list of posts I have written on the Solomon Goss blog about the Keller, Delano and Spracklin connection and it might not be all but it is a good overview. Daniel D. Spracklin a Son of John and Lydia Spracklin, January 26, 2014. Daniel’s In-Laws John and Mary (Delano) Keller a connection to DAR and to the “Fortune.” February 12, 2014. The Keller & Delano Family Connection, February 20, 2014. You will also find posts about Daniel, Elizabeth and Sarah on this blog as well. You can use the search engine or the categories to find them. They are a little older then the ones on the Solomon Goss blog and some of the information may need to be updated. I will deal with that later. 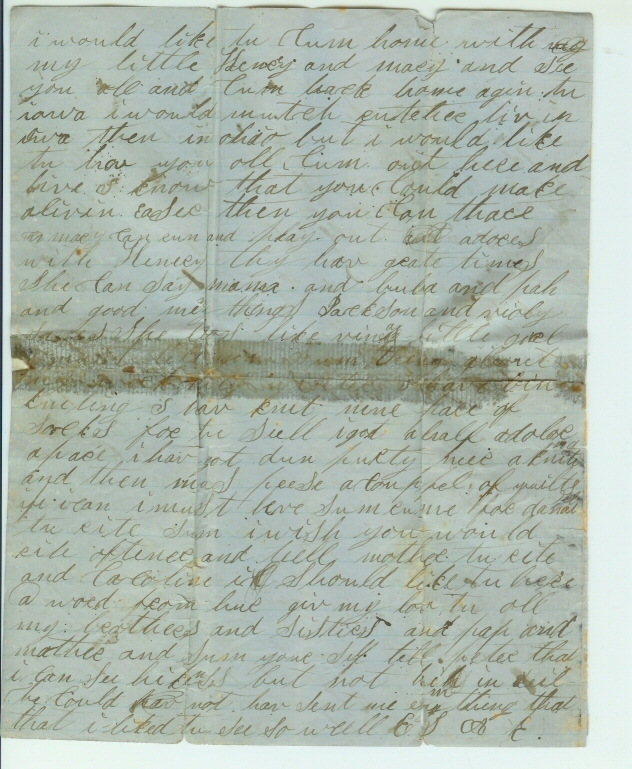 The partition deed of John and Mary Keller’s land featured in the post dated October 8, 2011 “Partition Deed: Morrow County, Ohio 1884,” connects Amarilla to the Keller family. To understand Amarilla you have to understand that she was part of a very large family, actually two, as well as extended families of Keller and Spracklin. 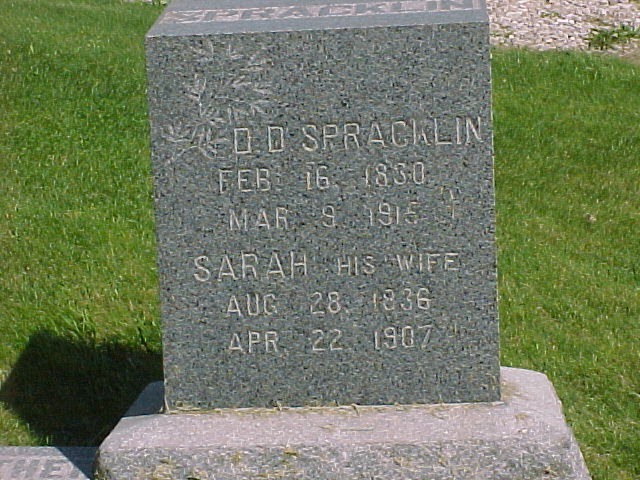 Her father Daniel D. Spracklin married twice as I have indicated in past posts. So Amarilla had full and half siblings. 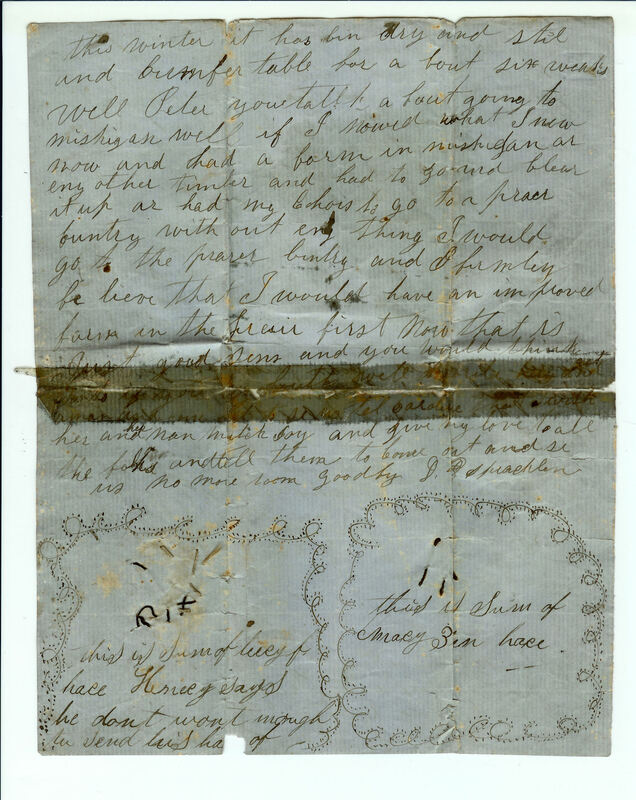 Daniel’s married first to Elizabeth Keller and they married in Morrow County, Ohio on the 28 December 1852 (another source as their marriage 1 Jan 1853). By 1856 they had migrated to Benton County, Iowa and settled there. Sadly Elizabeth Keller died the 10th of March 1859 just months after she gave birth to Amarilla. Amarilla never knew her mother having been born the 18th of November 1858. She was just a baby! This marks the first tragedy that my great-grandmother Amarilla experiences in her life. 1. Henry Franklin Spracklin b. 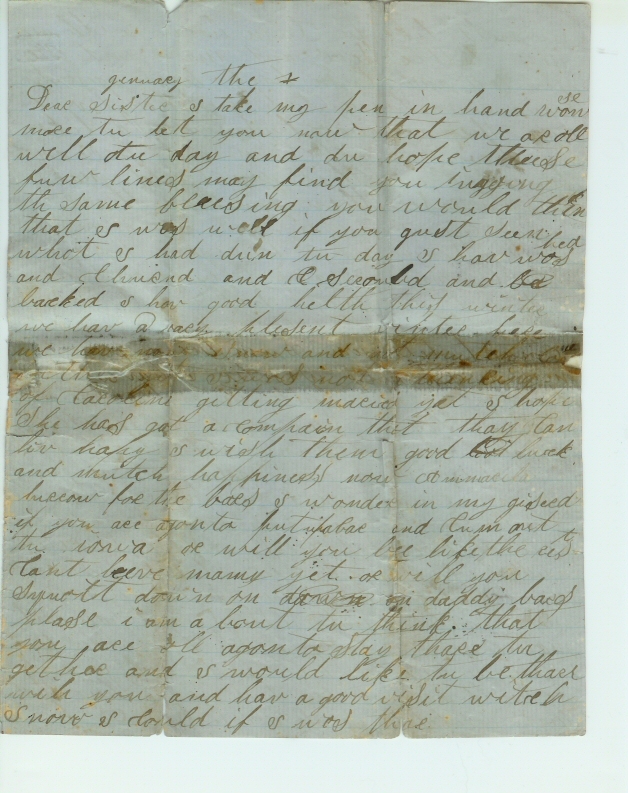 13 September 1853 probably in Toledo, Ohio as his parents began their journey to Iowa. He married Elizabeth Downey 16 November 1875 in Keokuk County, Iowa. He died 22 June 1893 in Davenport, Iowa in a lumber mill accident leaving 9/11 children. He was listed as a grantor in the partition deed along with his sister Amarilla Barkley. It placed Henry in Muscatine County, Iowa in 1884. 2. Oliver Solomon Spracklin b. 18 October 1854 based on the U.S. census. He was probably born in Iowa. He died 10 September 1855. 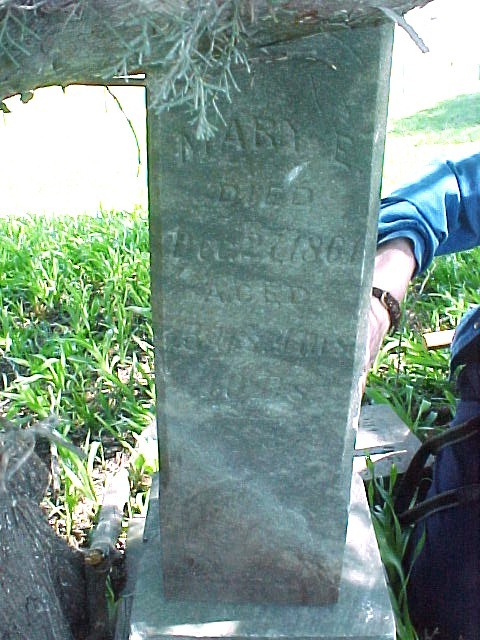 He is buried in Titler Cemetery northwest of Marengo, Iowa with his sister Mary and mother. 3. Mary Ellen Spracklin born 17 August 1856 in Iowa and died 27 September 1861 in Iowa. Mary is also buried in Titler Cemetery with her brother Oliver and mother Elizabeth. 4. Amarilla Grace Spracklin was born 17 November 1858 in Benton Co., Iowa and died in Pine River, Cass County, Minnesota 10 August 1942 under the married name of Urton. 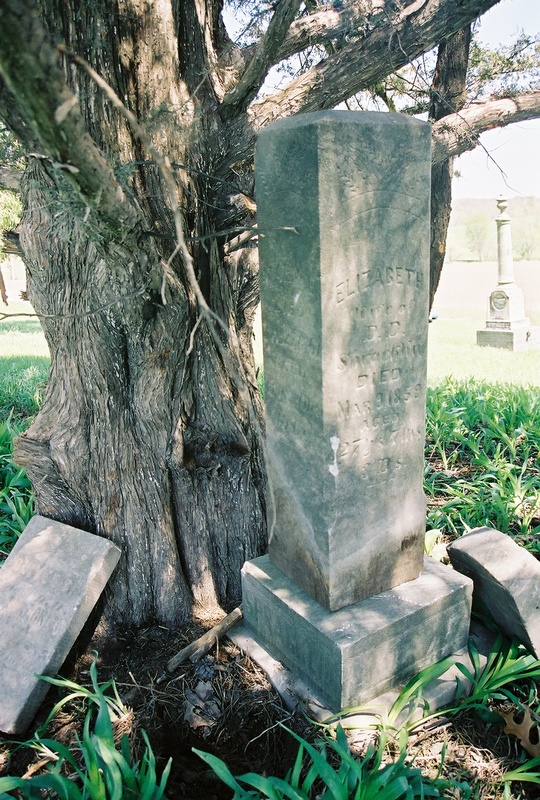 She is buried in the Evergreen Cemetery in Brainerd, Minnesota near her first husband George Angus Barclay. 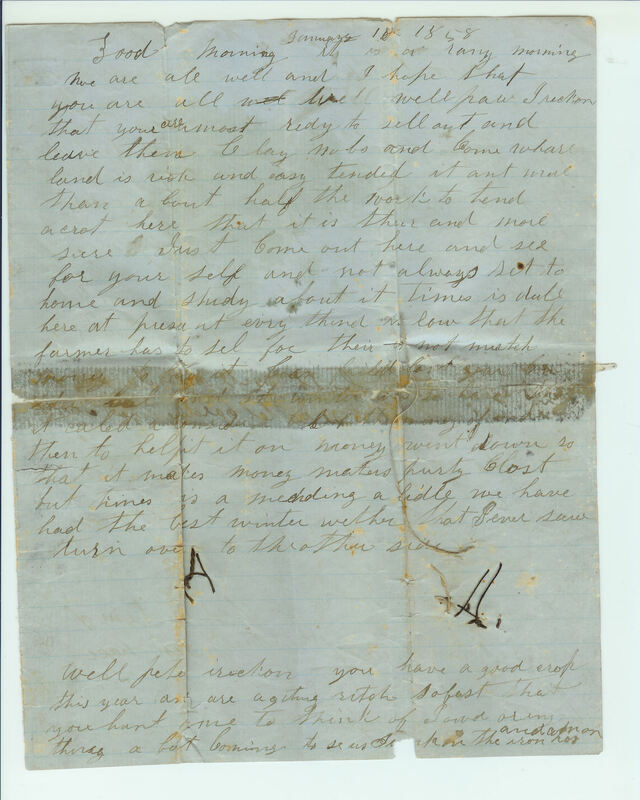 My Aunt Miriam had in her possession a letter written by Elizabeth on one side and on the other a letter written by Daniel dated January of 1858. I will share that with you in the next post for it further connects Amarilla to the Keller family. Ancestor Outline by Armindo Spracklin featured in the posted dated August 5, 2011 “Ancestor Outline by Armindo Spracklin,” on my other blog: Solomon Goss of Fearing Township in Ohio. This outline was given to me by my Aunt Miriam. Armindo was the wife of Charles Edward Spracklin, one of Amarilla’s 1/2 brothers. 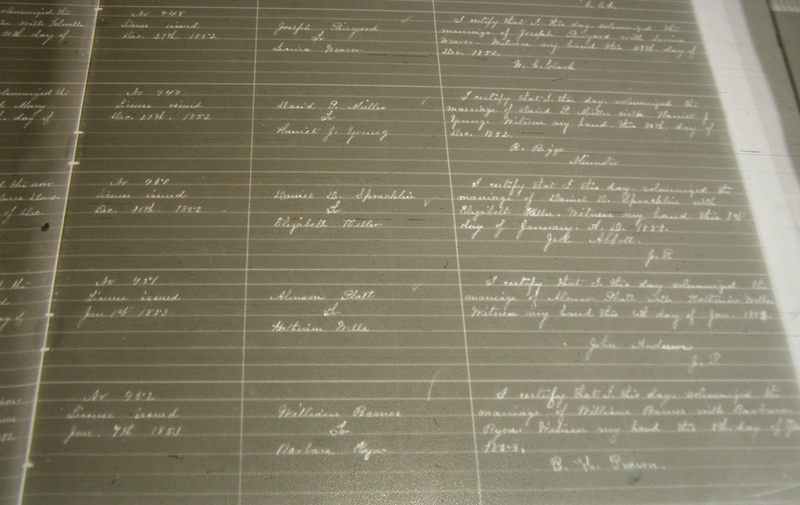 Family History Notes of Miriam McDonald, grand-daughter of Amarilla Spracklin Barclay, approximately 8 pages. There is personal information contained in these notes so I am carefully sharing them through this blog and other blogs. Death Certificate of Amarilla Urton, #02159, Aug. 10, 1942, Pine River, Cass County, Minnesota. , Minnesota State Department of Health, Records, Minnesota Historical Society, index online at the MHS. Cemetery Records of the Titler Cemetery originally by Mrs. Kaye Sanches of Des Moines, Iowa, retyped by Marion A. Gunderson, 2001, at the Iowa Genealogy Society Library. 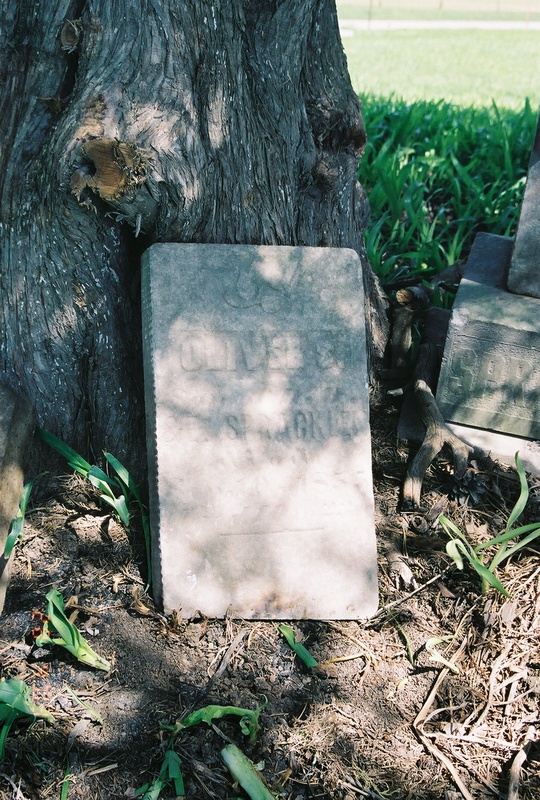 As you can see by the tombstone pictures above, the stones are up against a tree and not over the grave. There where depressions near the stones in the soil that I almost stumbled into. Visit to the Titler Cemetery by the compiler in April of 2003 when photographs of the cemetery were taken. Marengo, Iowa. See BJM’s Cemetery Discoveries blog posts starting with the date of July 17, 2010 were I feature the Titler photographs. Census for the State of Iowa 1856, Vol. 48, Film#1021301, pg. 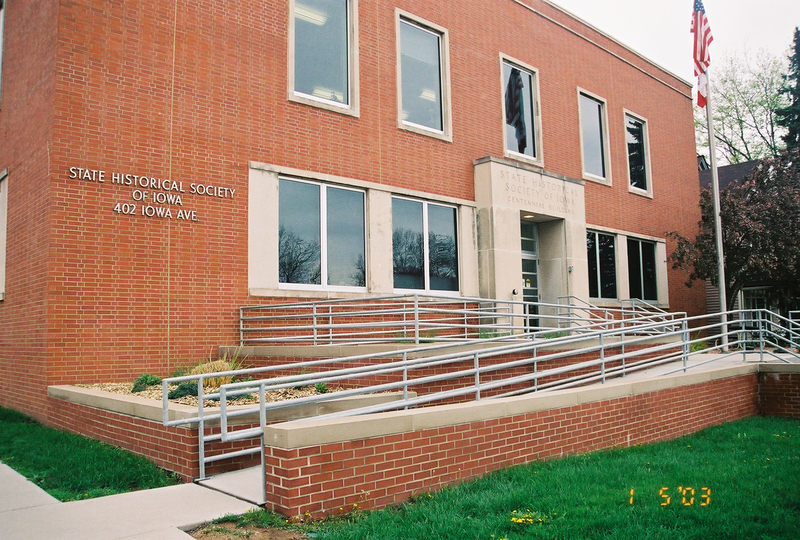 78-80 State Historical Society, Des Moines, Iowa. Be careful the index of this 1856 census does not show Daniel for some reason? Ancestry.com has the Iowa State Census. Also featured in the July 1, 2011 post (see below). Before Daniel and after him are Blacketers and Merrifields that are enumerated. 1860 U.S. Federal Census was discussed in the post dated July 1, 2011 “Stepping Back In Time: Amarilla’s Life In Iowa Before George!” on this blog. Marriage Records, 1848-1951, Index 1848-1948 FHL#388779 Morrow Co., Ohio. Vol. 1A, pg. 119 for Daniel and Elizabeth’s marriage FHL#388779. Sources for Henry Spracklin and Amarilla will be detailed in future posts.